Publication: April 1st 2016 by Mirror Press. This is a tender read with very heartbreaking moments. This is part of the Matchmaker Series. It can be read as a standalone. There is one character who returns in each book who is Pearl. She is the matchmaker. She is seen in many time periods. This book we get to see Pearl talk a little more and reveal some of herself to her current couple she is matchmaking. Nelle has lost her parents and is now living with her Aunt. Her aunt is strict and appears bothered by Nelle and her living with her aunt and her cousin Alice. Alice is a shameless flirt. She is also expected to marry Matthew, their neighbor. It is sort of an arranged marriage. But Matthew still hasn’t yet proposed. Don’t worry; it wouldn’t be much of a story if he didn’t do as expected. Meanwhile, Nelle seems to have taken root into Matthew’s heart with her kind and thoughtful observations of Matthew’s life and mother. Matthew is also starting to embed into Nelle’s heart. He is also kind, thoughtful and caring. 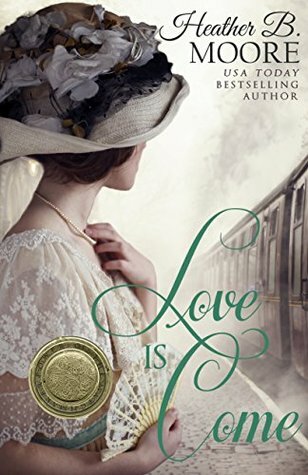 But with some stolen touches and acts of kindness they are finding it difficult to stay away from each other yet they know they must if Matthew and Alice are to be married. When Matthew’s mother becomes sicker it is Nelle who is there for his mother and him and not really Alice. Nelle plays her pianoforte for Matthew’s mother and it is difficult for her to play as it reminds Nelle of her father and his gentle love for her. Matthew’s mother is very fond of Nelle. Pearl has an apothecary store and Nelle is warmly embraced by Pearl. Pearl gives Nelle some kind words of advice and some teas and herb when she visits. But Pearl is not totally without magic of her own. And when things change Pearl is nowhere to be found. This is the story of two people who are in love with each other in a time where expectations are still part of how you live and who you marry. It is breaking both of Nelle and Matthew’s hearts in the meantime. Nelle will not do anything to interrupt that expectation of Matthew and her cousin’s wedding. But things aren’t always how they seem and love will always find a way. That’s what I got out of it anyway! I wished it wasn’t over and I could see more of them. I sighed at the end. Heather B. Moore is a USA Today bestselling author, with a dozen historical thrillers written under the pen name H.B. Moore. Latest is Finding Sheba (will be re-released Feb 2015 through Thomas & Mercer). Under Heather B. Moore she writes romance and women’s fiction and inspirational non-fiction, latest is The Fortune Cafe. Her various author names can be confusing so her kids just call her Mom.